It does not often happen that a student ensemble gets to put on multiple public performances of a single program, but such was the happy circumstance befalling the New England Conservatory Philharmonia under Hugh Wolff over the past week, with a performance at Sanders Theater last Friday and another on February 9 at Jordan Hall. That happy circumstance in turn begat another: our colleague John Ehrlich, having excellently reviewed the first performance here, we get to concentrate our attention on the one item that differed between the two concerts— instead of the Stravinsky Violin Concerto we heard a rare performance by legendary pianist and NEC Distinguished Artist Russell Sherman of the Concerto in F (properly thus, not the “F major” shown in the program) by George Gershwin. This is an item one would not normally associate with Sherman. This occasion also gives us an opportunity (be forewarned!) to dilate on the piece itself, and why in fact it is unfortunate, and a sad commentary on musical taste, that one should not associate this work with Sherman or any other pianist of his august stature. First, however, some reflections on the rest of the program, which was far from insubstantial. As you will know from reading Ehrlich’s review, it began with the Symphony No. 9 in E-flat, op. 70, by Dmitri Shostakovich, a work caught on the cusp between two aspects of the composer’s personality. To Ehrlich’s comments we would add that it always struck us that this work bears some similarity in its positioning within the composer’s œuvre to that occupied by Beethoven’s Eighth, making due allowance for the fact that Shostakovich wrote six more symphonies than Beethoven. It also, having irked Soviet authorities for its antithetic posture toward Socialist Realism and its — perhaps misinterpreted — spots of insouciance, gave them an opening to decry its “formalism.” We concur, too, with Ehrlich’s praise for the soloists from the NEC Phil and would like to supplement it with kudos for concertmaster Jennifer Wey’s rendition in the recapitulation of the second theme of the first movement, and principal trumpet Kathryn Driscoll for her work in the scherzo, plus a shout-out to all the lower brasses for their impressively sonorous and sinister irruptions in that movement. The finale was, in retrospect, particularly well thought through by Wolff and the orchestra: its subdued opening was carried forward as long as possible before the brilliant climax, casting the quintessentially Shostakovian cloud of doubt over the surface festiveness of its material, a cloud further thickened by the composer’s using a version of the second subject from his First Symphony in the same place in this movement. Of the second Ravel Daphnis and Chloë suite, we have even less to add to Ehrlich’s comments. We thought the opening was a bit too matter-of-fact and could have been softer, but all cavil vanished with the magnificent crescendo announcing daybreak. From there on, everything was glory, precision, and light-footedness. The prospect of hearing an artist of Russell Sherman’s stature attacking the Gershwin concerto was completely irresistible, and we confess we clamored with BMInt’s executive editor for the assignment to review it. 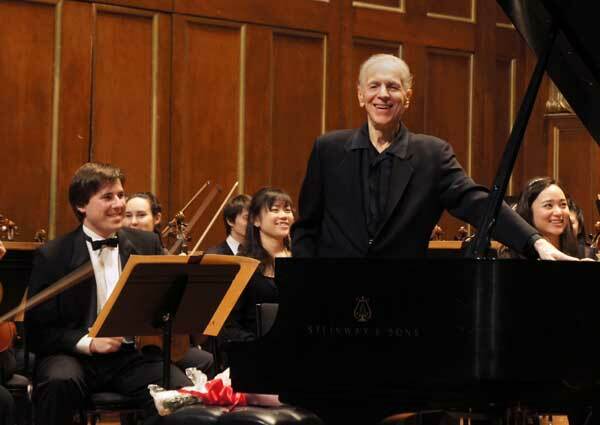 Sherman has brought his idiosyncratic and illuminatingly intellectualized interpretive powers to bear on most of the great piano repertoire, notably the Beethoven sonatas and concertos, so what, we wondered with anticipatory willies, would come of his immersion in this most demotic of piano concertos? We admit we planted a few verbal booby-traps in the preceding paragraph. Sherman is no stranger to the Gershwin concerto (though we didn’t know it before). He claims in his program note to have loved the work forever, and he did record it in 1995 with Gunther Schuller and the Orchestra of St. Luke’s; but that was in the stripped-down orchestration Ferde Grofé made for George Whiteman’s orchestra (presumably authorized by Gershwin) for a preliminary run-through, before handing the final Gershwin-orchestrated version to Walter Damrosch, who commissioned it for the New York Symphony Orchestra. More pertinently, to call the Gershwin concerto “demotic” is, as with so much of Gershwin’s concert music, both its blessing and its curse. For even in this day of the “big whatever” when it comes to style, there is an enduring condescension at work that condemns the concerto to pops concerts and niche repertory. Check out the list of extant recordings of the concerto in particular and you will find quite a few, but mostly by pianists you have never heard of, or by a handful of devotees with crossover linkages, like Earl Wild, Leonard Bernstein, and André Previn. OK, there is one by Garrick Ohlsson — the blessings of heaven be on him, and of course the Sherman-Schuller collaboration, and of course the old recordings by Oscar Levant, who thought he was George Gershwin. The fact is, however, that the great international heavyweights continue to shun it. Why? Because everyone who is anyone knows that Gershwin is déclassé, a great tunesmith who was out of his depth in classical music, a dilettantish naïf. Even this doesn’t go far enough, for we submit that virtually every tune in the Gershwin concerto is intrinsically linked to the big melody that follows the introduction in the first movement. This is built, as so many great works are, on the slightest of nodules, a rising and falling minor third — in harmonic context, the “blue note” interval — supported by seconds and fourths limning a minor seventh chord. The only exception of significance may be the opening trumpet theme of the second movement, but there may be a deep-structure relation we haven’t pierced yet. Thus, the concerto should be regarded in light of works like the Debussy String Quartet and the Brahms Second Symphony, both similarly tightly integrated and consequently beloved of habitual explicators. On top of this, Gershwin imposes an interesting adaptation of Classical forms, in which the lyrical second subject of the opening movement is not repeated in the recapitulation, so as not to interrupt the dramatic flow to the movement’s end. The finale, in rondo form, also acts as a grand recapitulation of the whole work, in a manner familiar in late-nineteenth- and early-twentieth-century composition. What the Gershwin concerto also is, of course, is the avatar of the Jazz Age, with snappy rhythms and jazzy dissonances layered over a diatonic foundation. Just as 1920s Art Deco was the last flourishing, in modernish garb, of the older decorative traditions, the jazz-infused works of the 1920s were the last chance for composers to be modern yet tonal without being self-consciously retro. Sure, this was the period giving birth to twelve-tone writing and noise music à la Antheil, but composers of great lyrical gifts like Gershwin, Milhaud, and Carpenter could still be up-to-date without hiding their lights under a bushel. For all these reasons, it is perfectly rational to assess Gershwin’s as The Great American Piano Concerto. With this technical and cultural background, then, what kind of interpretation ought this work to receive today? From artists of Russell Sherman’s brooding intelligence and Hugh Wolff’s discernment we had high expectations of a fundamental re-examination that would stress its unity while preserving its fresh-faced razzmatazz. Sherman wrote a program note that, apart from some irrelevant political gibberish, stressed Gershwin’s role as a great unifier in American culture. That he certainly was: the last art composer in this country whose death brought forth a national outpouring of grief. We are still a bit uncertain about what happened on Wednesday night, but we know for sure that it wasn’t what we, perhaps unreasonably, expected. Not that the performance was the same-old-same-old, either. It was iconically Shermanesque, full of quirky rubati and counterintuitive stresses and phrasing. We have to say, straight off the bat, that for the most part Wolff and the orchestra were wonderful. The opening of the first movement (the third as well) was a bit more subdued than other performances we have heard, and in the great trumpet solo that presents the main theme of the second movement, Diana Wensley (like Ehrlich, we’re going by what the program said, and hope we’re crediting correctly) got its bluesy feeling exactly right the second time she played it, while Wey once again came through with some perfect pitch-bending. As for the soloist, all we can say is that those familiar with his approach would have nodded or shaken their heads, in accordance with how that approach grabs them. He is, at eighty, no longer at the peak of his technical powers; we sensed moments of uncertainty, as when he visibly stopped his hand from going somewhere it shouldn’t. Moreover, in the finale, whether for technical or, as we suspect, interpretive reasons, there were issues of coordination: Wolff was keeping a very close eye on Sherman, though, and didn’t let the disconnects last long. More credit to him. While it is always instructive to hear what Russell Sherman has to say about any piece, we felt that this time what we were hearing was more about Russell Sherman than about Gershwin. That this is so was borne out by Sherman’s encore, a reading of a straightforward arrangement (we know not by whom) of “The Man I Love,” in which the performer’s trademark traits were uncomplicated by orchestral accompaniment. That sort of thing can be, and was, greatly entertaining and enlightening; but we’re still waiting for someone to lead the way to a proper understanding of Gershwin’s Piano Concerto in F.
Thank you, Vance, for your fine review. I, too, put in a bid to review this concert, but I’m glad it went to you since your musicological/cultural/aesthetic analysis of the Gershwin Concerto in F was so illuminating; it can only help those of us who deeply love this piece proselytize that much more effectively for it. Eighty-odd years after its composition, it’s annoying that we continue to have to place the piece in a classical context for the less open-minded simply because its musical language is so often jazz-derived. Certainly, such classical luminaries as Maurice Ravel and Nadia Boulanger sufficiently recognized Gershwin’s unique achievement that they declined to teach him when he asked. I attended the concert and agree entirely with your assessment of the performance. While Sherman’s interpretation isn’t always my ideal, it certainly provides food for thought; I’d love to find his recording with Schuller. By the way, the arrangement of “The Man I Love” is Gershwin’s own, from a set of a dozen or so of his most popular songs he arranged for piano solo. As for adventuresome heavyweight pianists who might be persuaded to look at the Concerto, Marc-Andre Hamelin, are you out there? And while we’re at it, let’s further stir up interest in neglected American concertos (OK, Gershwin’s isn’t neglected, it’s just improperly appreciated) by allowing me to put in a good word for John Alden Carpenter’s Concertino, written ten years before Gershwin’s concerto and even then showing major influences of American popular idioms. The slow movement is very much blues-influenced (as is the slow movement of his violin sonata), and there are Latin American touches in the outer movements, and so forth. It’s well worth reviving, and, as a plus, nobody to my knowledge has ever recorded the cadenza Carpenter wrote for it years later. For a rendition of the Gershwin Concerto by one of the “greats” look for for a recording (available online as well in streaming media) by none other than…….Sviatoslav Richter. Jean-Yves Thibaudet’s performance of the Gershwin Concerto in F at Tanglewood last August was favorably reviewed here by Eli Newberger, if I remember correctly. After reading this pointless, self-indulgent article, two things are clear to me. First, the reviewer does not know Gershwin’s music. And it is very unfortunate to sense that only his opinion and idea about the music matters. What about the renowned Jazz Professor at Berklee who said that Sherman played better than any Jazz pianist he knew. And what about 99% of the audience who erupted with the last note and gave endless ovation for this performance? Are they fools? or are you fooling them? Second, the reviewer must be a devoted republican… for he doesn’t have any capacity in his heart to find Gershwin’s spirit described wholeheartedly by Mr.Sherman in the program note. To spin it as ” irrelevant political gibberish ” is ultimate insult to those who understood true meaning of that. This YouTube link of Oscar Levant is certain to lighten anyone’s mood. First of all, “music lover’s” comments go outside of basic decency and politeness of human discourse, be it “republican” or “democratic” in style (talk about irrelevant!). Secondly, the audience erupting in ovataions after a Sherman concert in BOSTON is by no means the basis to judge his performance. Sherman has a cult following in this town, people who adore his playing no matter what and how he plays, poeople who created a true “cult of personality,” out of him as disappointing or, from another perspective, unreasonable and useless as this may be. Indeed, people have for ages erupted in standing ovations when Stalin (or other “cultivated individuals”) have given and continue to give their speeches in places where a similar “cult of personality” was institutioned, regardless of how fantastiacally sensible of fantasitacally inane these speeches might have been. On the other hand, a musician who at the age as advanced as Sherman’s is still a youthfully enthusiastic performer does deserve a standing ovation, simply for life-long long dedication to his art, regardless of how well he plays on a particlular night. An audience not being made up of fools as the “music lover” (possibly erroneously:) concluded, does feel this energy and does indeed stand up to cheer and applaud–and so they should! Finally, I do wholeheartedly agree with the reviewer’s assessment of the performance and, just to be clear, Mr./Mrs. “Music Lover,” I am a staunch Democrat. A smiley face…. In my understanding of those times that it was the era of Jim Crow, restricted neighborhoods and isolationism. Marian Anderson was barred from Constitution Hall, etc. And btw, it was a republican president, Dwight Eisenhower who enforced Brown vs Board of Education and ordered the National Guard into Little Rock to integrate the schools. When did it become an indecent act to call someone republican? Is there something wrong to be one? And I am appalled to find those words “cult”, and “Stalin”… sounds like fox news to me. Is it so hard to understand that there are people with different view of life and music? One irony in Mr. Koven’s February 10 review is particularly concerning: to term Gershwin’s Concerto “demotic,” to decry its lack of stature in our music culture, then to proclaim Gershwin, “The last art composer in this country whose death brought forth a national outpouring of grief”? What of John Lennon? Or Kurt Cobain? Not art composers, Mr. Koven may sniff? Maestro Robert Levin, I urge you to read the material appearing under your name on the BMI masthead. Self-indulgent prolixity from a critic is one thing — “reviews and articles are professionally edited…”? — elitism in the guise of populism is more dangerous. I wasn’t around when George Gershwin died, but I don’t remember anything that could credibly be called a “national outpouring of grief” when Kurt Cobain died. And although John Lennon was physically in the United States when he died, he was a British composer. Beyond that, it seems to me that Arthur W. merely wants to define the term “art composer” differently from how Mr. Koven understands it. One doesn’t have to “sniff” in order to note that Gershwin composed works such as the piano concerto with the intention that they be performed by soloists and orchestras such as Mr. Sherman, the NEC Philharmonia, or the BSO in venues such as Symphony Hall, Jordan Hall, and Sanders Theater and for audiences who frequent such venues, while Lennon and Cobain didn’t have such performers, venues, and audiences primarily in mind (not to put too fine a point on it). If Mr. W. wishes to propose another term to refer to Gershwin and others who had such intended performers and audience, and to insist that the work of Lennon and Cobain is also art, fine. But it will not do to deny the distinction. I’m going to slip in here for a moment, not to engage in the interesting discussion that’s been going on–carry on, folks, don’t mind me–but to correct a factoid that in my review I offered as a possibility, namely that Grofé’s arrangement of the concerto that Sherman and Schuller recorded was the “tryout” version before Gershwin delivered the ms. to Damrosch. I received today the CD of that recording, and in its booklet commentary (unsigned) it indicated that the arrangement was made in 1928 in advance of a tour Whiteman’s orchestra was going to make in Europe. I can’t confirm this either, but if it’s true it was an after- rather than before-the-fact orchestration, making Gershwin’s own the Urtext, as it were. The fact that Mr. Sherman wore ear plugs during his performance of the Gershwin might have contributed to the difficulty of getting it together with the orchestra. God forbid the sound of the orchestra part were to infringe upon his “artistic arrhythmia”. According to David Daniels’ “Orchestral Music” it is indeed “Concerto in F major”, as written in the program and not “Concerto in F”, as stated by the author of this review. I note with appreciation Chris Kies’s comments, and point out that my later information on the commissioning of the Grofe is consistent with his. I mentioned it in an earlier comment posted above. As to which version is better, obviously de gustibus and all that. I’m still with Gershwin on this–I found the Whiteman band arrangement a bit harsh.